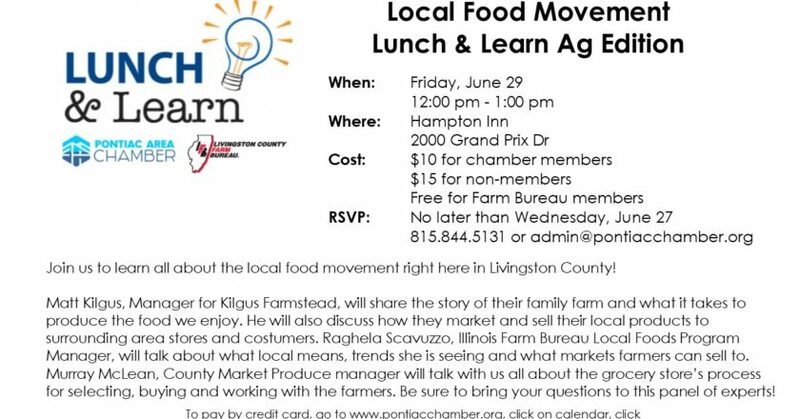 Join us to learn all about the local food movement right here in Livingston County! Matt Kilgus, Manager for Kilgus Farmstead, will share the story of their family farm and what it takes to produce the food we enjoy. He will also discuss how they market and sell their local products to surrounding area stores and costumers. Raghela Scavuzzo, Illinois Farm Bureau Local Foods Program Manager, will talk about what local means, trends she is seeing and what markets farmers can sell to. Murray McLean, County Market Produce manager will talk with us all about the grocery store’s process for selecting, buying and working with the farmers. Be sure to bring your questions to this panel of experts!